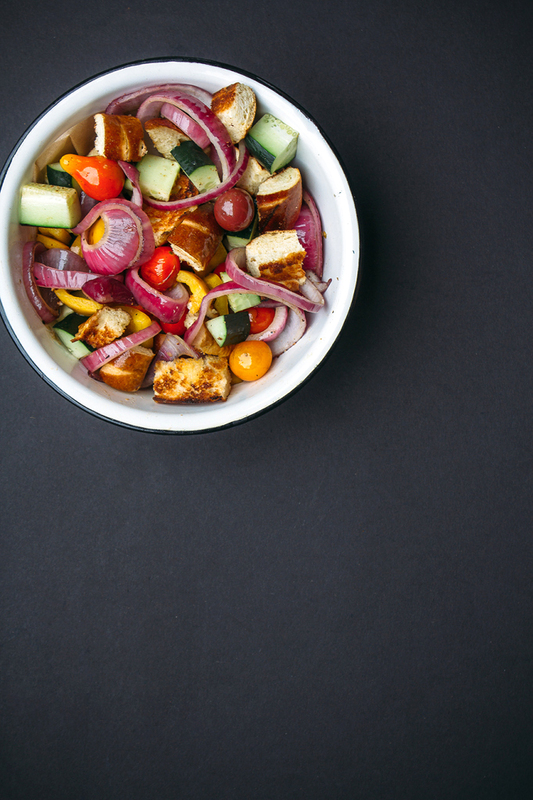 This Grilled Pretzel Panzanella Salad is the perfect grill out veggie side dish! If you are located here in the states then you are probably having a hard time getting into the groove of this week knowing it’s going to be a short one. With Friday being a national grill-copious-amounts-of-food holiday (oh and a celebration of the countries birth), I’ve got grilling (and eating. and watching fireworks. and swimming) on the mind. Living in a smallish town has it’s perks – it is easy to walk to the local co-op to grab vegetables for dinner. Taking a nightly bike ride is never interrupted by honking cars. You don’t ever have to wait for a table at your favorite local eatery and weekends are spent swimming at the neaby lakes and quarries. 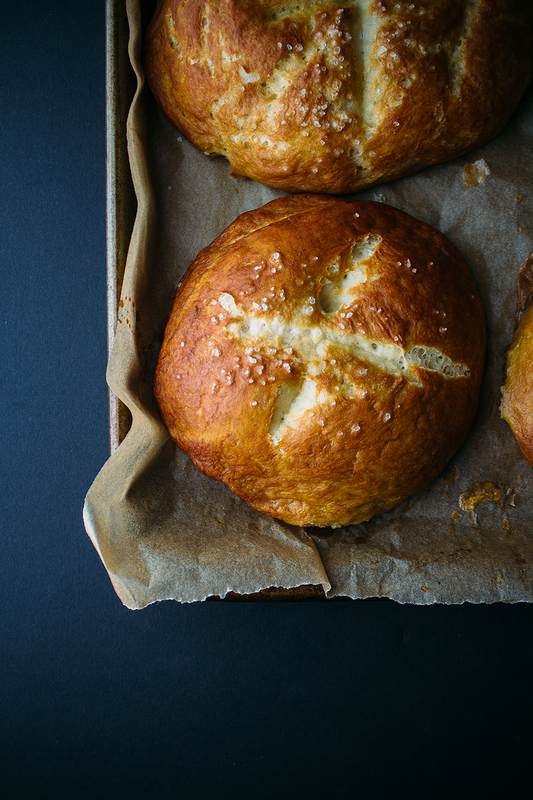 The downside is that sometimes resources can be limited – in this case, pretzel bread. I love making homemade bread but it’s not the first activity I get excited about when it’s already 90 degrees in my kitchen. My lack of success after adventuring to 3 grocery stores, 2 co-op stands, and our local bakery to find pretzel bread only made me more determined. 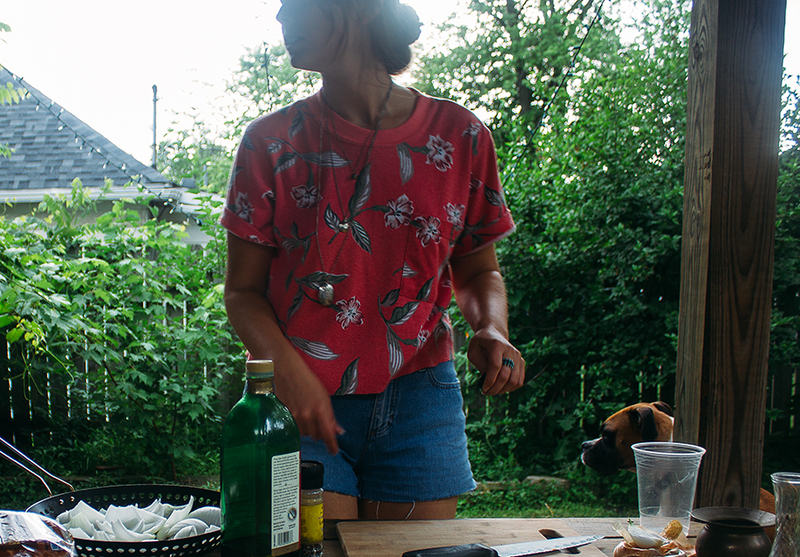 If only we had a Trader Joes around here… I kept thinking, which just enraged me more. Finally, I took a deep breath, pulled out my rolling pin, and whipped up 6 mini-loaves of pretzel bread. Do you need to make fresh bread for this recipe? No. In fact, I may even advise against it since you’ll need to then let it sit for several days to become stale enough to truly be panzanella. But, if you are feeling overly ambitious or lack pretzel bread in your town, like me, then feel free to start on this a few days early with the bread and come back to it when the bread has become slightly stale. As I mentioned in my last post, our kitchen doesn’t have air conditioning so our grill has been essential in whipping up weekly dinners. 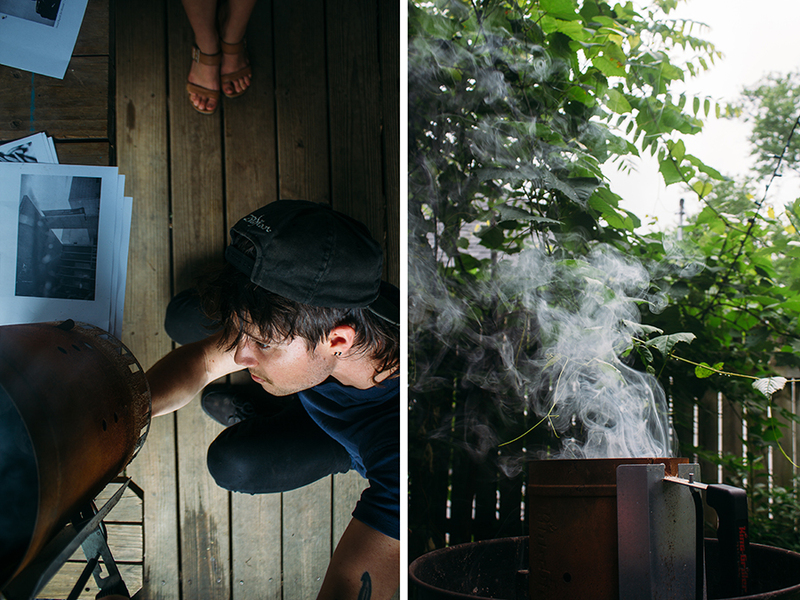 The (very) slight breeze and fresh air makes it almost bearable to chop endless amounts of produce and whisk herby vinaigrettes, on an empty stomach, as the grill takes its leisurely time getting warmed up. 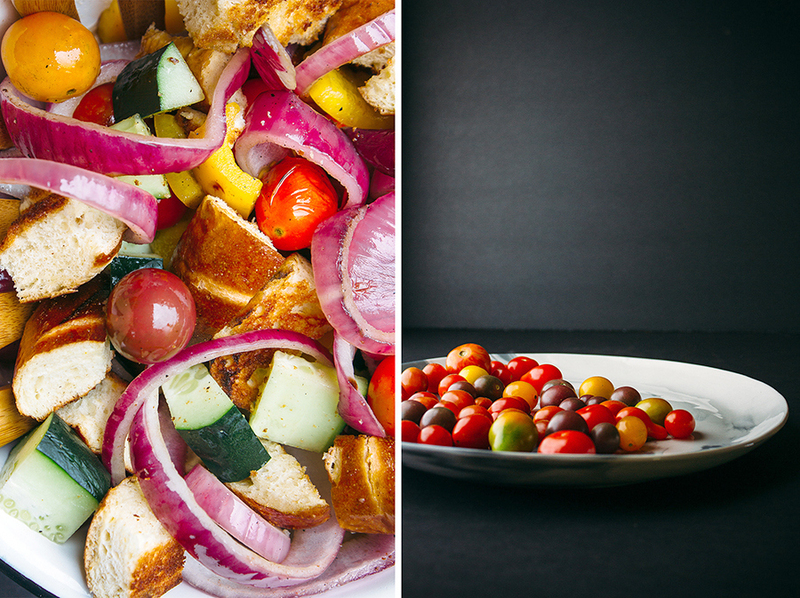 Anyhow, I hope you are whipping up something fierce for the 4th and if you don’t have anything in mind yet then I encourage you to try out this Panzanella salad! Oh and don’t get burned by any fireworks this year! And buy your puppy a thundershirt if they are scared of the big bang and booms. And, last but not least, enter my giveaway below!! NOTE:Salad can be made up to 4 hours ahead of time. NOTE: If you don't have a grill basket then grill your vegetables in large chunks and slice smaller once they are finished grilling. 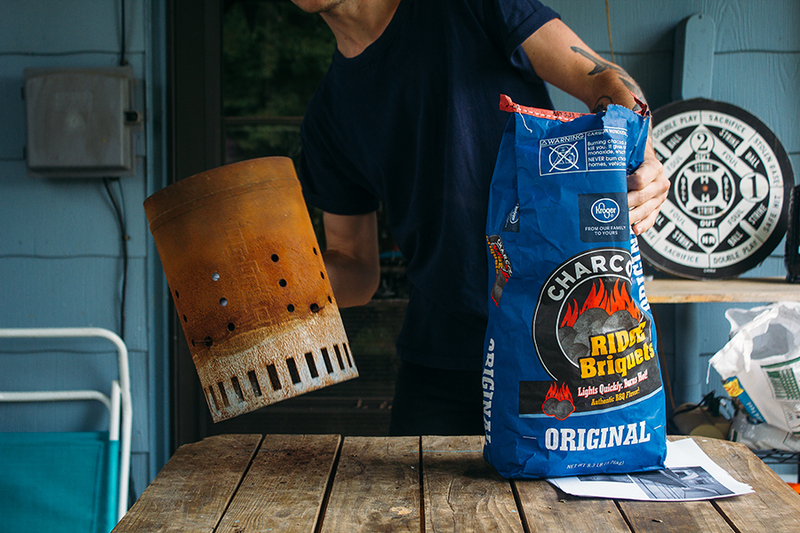 Prepare your grill in your usual fashion (charcoal or gas grill is fine). Transfer the bell pepper, onion, and cherry tomatoes to a grill basket. Use a tablespoon of olive oil to spread over the bread on both sides and coat the basket vegetables with 1/4 cup olive oil. Once your grill is ready (you want it to be hot but not so hot that everything will burn right away), add the basket to the grill and let the vegetables cook until the tomatoes are almost ready to burst and the veggies have brown spots all over them, making sure to stir the vegetables frequently to prevent burning. Place the pieces of bread on the outer edges of the grill (once it has cooled a bit and not as hot as it was with the vegetables) and let cook for just 30 seconds or so on each side, paying careful attention to check often to prevent burning. The time for this is going to vary greatly since your grill is going to be a different temperature than mine so be mindful to watch it closely to avoid over cooking the bread. Remove from grill and set aside to cool. Once cool enough to handle, cut into 1 inch thick pieces and add to the grilled vegetables. Add in the diced cucumber. 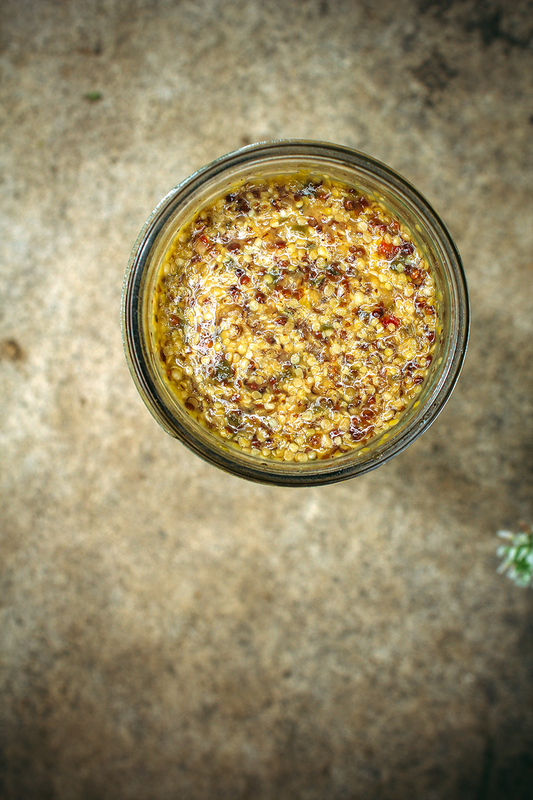 Whisk together the mustard, vinegar, J. R. Watkins spices, salt, and pepper. Slowly add in the remaining olive oil while whisking constantly until emulsified. Drizzle over the salad and toss to coat. Enjoy! Oh and did I mention I have a giveaway for you? If you were anything like me then you probably got overly ambitious this spring and cleaned out all the kitchen cabinets without ever fully filling them back up. Or you probably have spices sitting in your cabinet that are years old and probably have no nutritional properties left in them. Well, have no fear because I’m giving away NINE spices (sorry, to be completely honest there, there were ten but I stole the extra cumin for myself. muhahahaha) to replenish your seasoning cabinet. 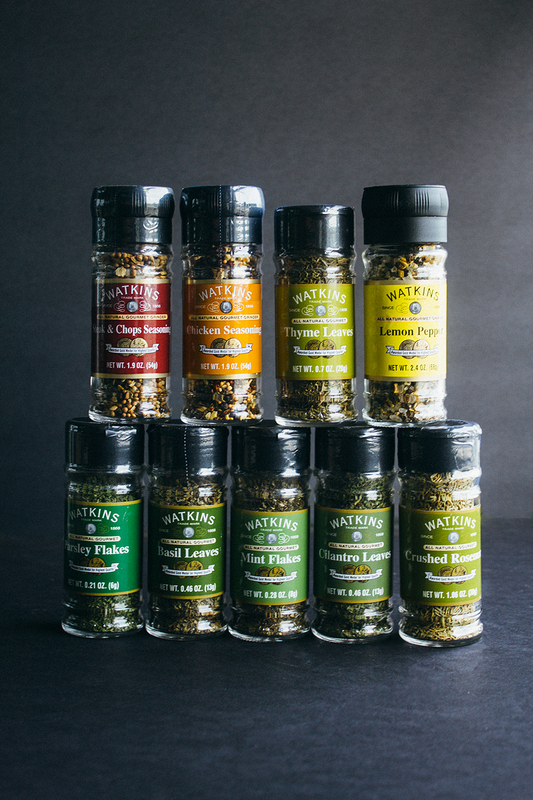 Also, don’t be fooled by names such as ‘chicken seasoning’ and ‘steak seasoning’ – sure these could be used to season meats but they are also delicious on eggs, roasted vegetables, and grinded over soup. The ‘chicken’ seasoning is just a mix of peppercorn, mustard seeds, and dried bell peppers while the ‘steak’ seasoning is composed of coriander, peppercorns, garlic, and parsley. But let’s not stop there! 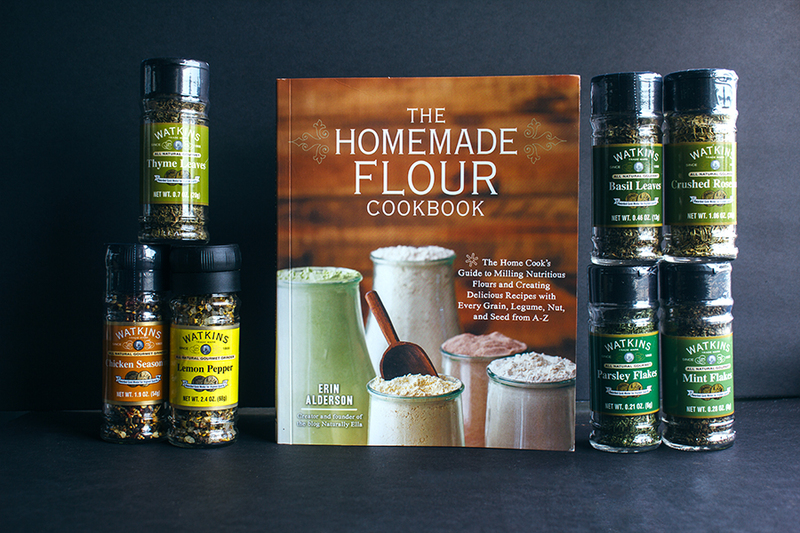 In addition the spices, I also have The Homemade Flour Cookbook by the wildly talented Erin Alderson of Naturally Ella as part of this giveaway! If you thought your pantry was equiped enough with just white and wheat flour, just wait until you discover all the nutritious and exotic flours that you could be making on a regular basis out of some of the cheapest bulk ingredients (lentil flour? chickpea flour? pistachio flour, anyone?). I whipped up some ridiculously delicous cookies from the book last week with some homemade oat flour and am now hooked! The recipes in this book are super easy to follow and the guidance on milling your own flour is priceless. And lastly, did I mention there are Vegetarian Ventures MAGNETS involved? Yeah, I know – who wouldn’t want a set of those to show off on their fridge? Anyhow, the giveaway will go for 14 days and I will announce the winner on my blog shortly after, along with contacting the winner via the email they’ve provided when entering – best of luck! I hope you win! *Yikes, guys! Sorry this was such a long one today! 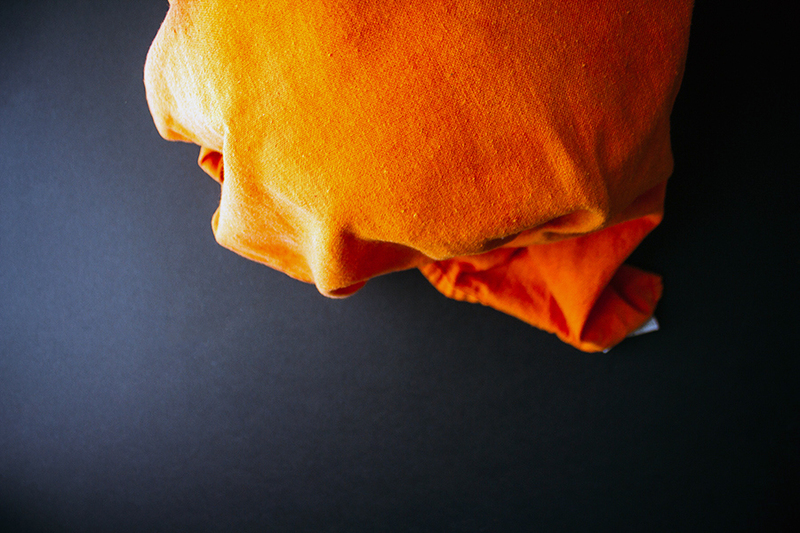 I guess that is what happens when you are deprived of your oven (due to unbearable temperatures) and end up spending way too much time outside shooting photos with your camera. My favorite summer salad involves whatever I get from my CSA! Hopefully lots of tomatoes and cucumbers. I soo love panzanella salad, but never thought to make it with pretzel bread. Pretzels are my FAVOURITE thing in the world!!! I love a yummy fruit salad in the summer, especially one that has some chopped mint and lime juice in it! This salad is totally making me squeal!! LOVE the pretzels in there! I love everything about this! Salty soft pretzel, smokey grilled veggies, mustardy dressing! A million times YES! My favorite summer salad would have to be a bed of rocket with figs, prosciutto, heirloom tomatoes, and mozzarella, with a reduced balsamic drizzle. Yum! YUM, anything with tomato-mozzarella-basil, can’t beat the classics! My favorite summer salad is arugula (dressed with olive oil & lemon) with peaches/apricots and burrata. But I looove panzanella too. This looks fabulous. A taco salad with tomatos and grilled corn 🙂 yum! My favorite is a pasta salad with olives, tomatoes, and other vegetables — whatever I’m in the mood for. My favorite summer salad is kale, strawberries, walnuts, and cranberries. I like a red quinoa salad with fresh fruit. 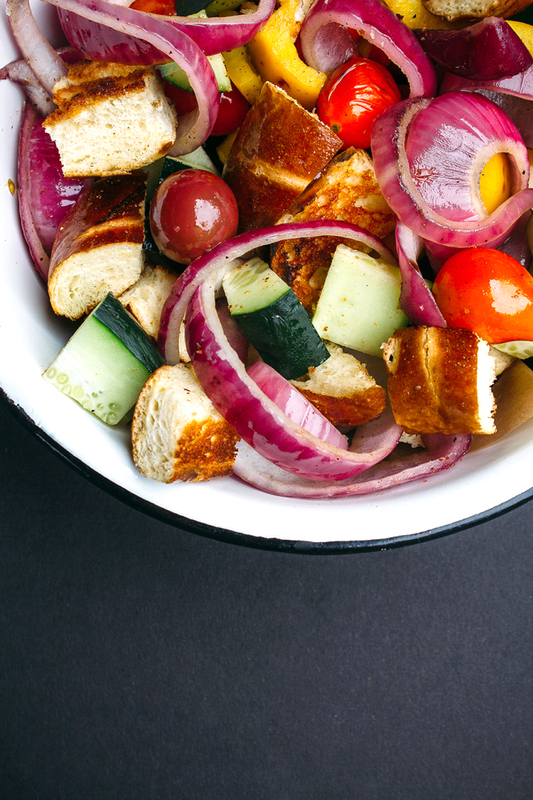 Oh my gosh oh my gosh oh my gosh GRILLED PRETZEL PANZANELLA SALAD?!?!?! You are a freaking.genius. THIS is exactly what I’m going to do with the leftover pretzel roll in my freezer (erm…if it doesn’t have freezer burn already. whoops.) My favorite summer salad is anything with grilled vegetables in it! I’m a sucker from some char-grilled zucchini or eggplant…or anything with a miso-y, gingery dressing. Why can’t summer last forever?! I just discovered a watermelon gazpacho featured in the Vegetarian Times. Refreshing, easy to modify and it keeps for a several days. This looks amazing! Do you happen to know the serving size for this or any other nutritional information?